A fisherman casting his fish net in the fast moving water. In hopes of bringing up some delicious fish for his table. But then came this brown pelican slowing walking closer from behind. Eagerly awaiting the raising of the net from the cool waters. Looking for an easy dinner to be served. How could the fisherman not resist that cute face. Of course he was going to share his bounty. With each pull a single fish would be in the net. Quickly to be devoured by the pelican. I love your stories!!! They speak to our whole community…. This was awesome to watch. He have the pelican about 5 fish from five different pulls. 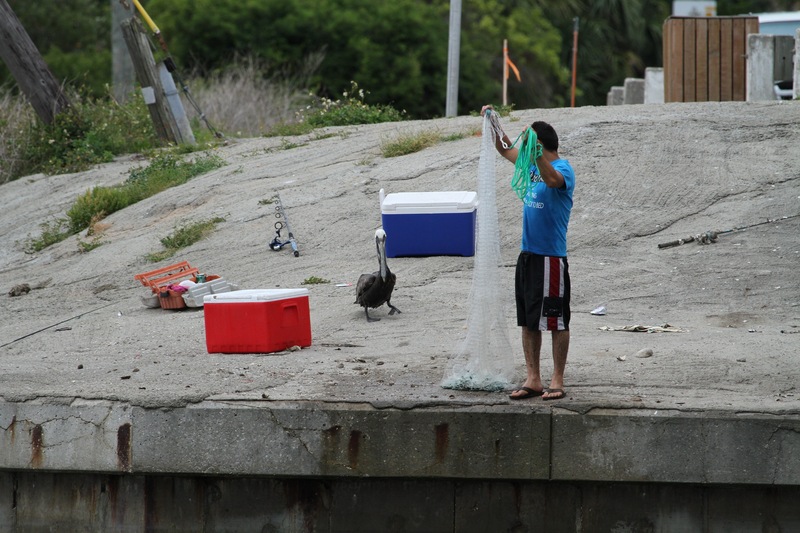 Each time he brought the net up, the pelican rushed in to see what he had. Ummm..I’d say no way Jose! How wonderfully captured! A lovely moment to freeze in time. It really was priceless and I was so happy to experience it. Thanks Fatima. They sure are! I’ve had many a fish & a bag of chips stolen by those funny birds!! They were laughing with delight at the pelican’s enthusiasm. I was enraptured by the scene. A pelican pan handler. Good job.